The Bible says that “All Israel will be saved” but does this mean every single Israelite or Jew will be saved? Many who are critiques of the Bible and of God don’t see why they need saving? They ask, “Saved from what?” They might believe they are being saved from hell but whom or what are they (and we) actually saved from? Surprisingly, we are saved by God but saved from God. In other words, when we are saved, we are saved or spared from the wrath of God which abides on every person who refuses to believe in Christ (John 3:36b). The Apostle Paul addresses those who have refused to come to repentance and faith in Christ by saying, it is “because of your hard and impenitent heart you are storing up wrath for yourself on the day of wrath when God’s righteous judgment will be revealed” (Rom 2:5). I can’t think of anyone who really wants to store up the wrath of God to be revealed against them on the Day of Judgment. Even non-believers have no real excuse for denying the existence of God (Rom 1:20) because they are simply suppressing this knowledge. Many who are not saved don’t understand that they are dangling over the pit of hell every moment they take a breath while living apart from faith in Christ. It is obvious that “the wrath of God is revealed from heaven against all ungodliness and unrighteousness of men, who by their unrighteousness suppress the truth” (Rom 1:18), which means, “for those who are self-seeking and do not obey the truth, but obey unrighteousness, there will be wrath and fury” (Rom 2:8). We are saved from our sins, from a separation of God, and from hell, yes, but primarily, we are saved from the coming wrath of God that will fall on all unbelievers. In the parable of the Prodigal Son, we see that the son finally came to himself and wanted to return to his father, and so it says, “when he came to himself, he said, ‘How many of my father’s hired servants have more than enough bread, but I perish here with hunger’” (Luke 15:17), but I don’t’ think he came to himself, by himself. In other words, he did not come to himself without God leading him to repentance. The Bible clearly teaches that God grants repentance as Paul wrote to Timothy that he prayed for those who opposed him, that “God may perhaps grant them repentance leading to a knowledge of the truth” (2nd Tim 2:25) since God “desires all people to be saved and to come to the knowledge of the truth” (1st Tim 2:4). Paul understood that “godly grief produces a repentance that leads to salvation without regret, whereas worldly grief produces death” (2nd Cor 7:10). It is not a “manly” or “human repentance” but a “godly repentance,” meaning God is the source of it. When Jesus began His earthly ministry, the first words out of His mouth were, “The time is fulfilled, and the kingdom of God is at hand; repent and believe in the gospel” (Mark 1:15), and “I tell you; but unless you repent, you will all likewise perish” (Luke 13:3). We’re told to repent and believe, but we can’t repent until God’s Spirit takes our stony heart out and replaces it with a heart of flesh. A heart that is bent toward pleasing God and not self. That is evidence that God has granted repentance. John the Baptist told the Jewish religious leaders that they needed to “Bear fruit in keeping with repentance” (Matt 3:8). Even though God grants repentance, those who reject Christ are still responsible for their actions, just as Judas was for betraying Christ and “turned aside to go to his own place” (Acts 1:25). To start with, the use of the word “all” doesn’t always mean every single person or thing. When the Pharisees began to grow jealous of Jesus’ ministry, they said, “Look, the world has gone after him” (John 12:19b). No one would expect that to mean every single person in the world has decided to follow Christ. Clearly, they didn’t, and neither did most of the Jewish religious leaders, so the use of the word “all” doesn’t always mean every single individual on earth. Keeping that in mind, we read Paul saying about Israel that “all Israel will be saved” (Rom 11:26). Does this mean every single Israelite that has ever been born or has since lived and died will be saved? If so, what about Judas who was part of the nation of Israel? We know that Judas was not saved as Jesus said, “For the Son of Man goes as it has been determined, but woe to that man by whom he is betrayed” (Luke 22:22). The word “Woe” is always used as a judgment that is to come, so “Who is the true Israel?” What does Paul mean by “all Israel?” We Gentiles were grafted into the natural olive tree, but every Jew which does “not continue in their unbelief, will be grafted in, for God has the power to graft them in again” (Rom 11:23), so apparently some of these Jews, identified as the branches, were broken off through unbelief (Rom 11:20), but they can, like we, be grafted back into the tree. So, who is Israel or who is a Jew in the eyes of God? Paul writes that “no one is a Jew who is merely one outwardly, nor is circumcision outward and physical” (Rom 2:29), rather, “if you are Christ’s, then you are Abraham’s offspring, heirs according to promise” (Gal 3:29). 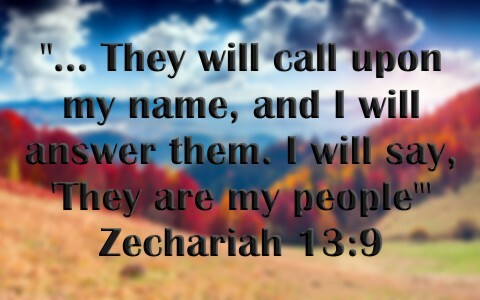 So it is just as God has said through Zechariah the Prophet; “They will call upon my name, and I will answer them. I will say, ‘They are my people’; and they will say, ‘The LORD is my God’” (Zech 13:9). The Bible is clear that “there is salvation in no one else, for there is no other name under heaven given among men by which we must be saved” (Acts 4:12). The reason that God raised up the Apostle Paul was as he said, “I have made you a light for the Gentiles, that you may bring salvation to the ends of the earth” (Acts 13:47). Paul had a heart for the lost, particularly his own Jewish people, but His purpose was both for the Jew and the Gentile, as God told Ananias, that Paul “is a chosen instrument of mine to carry my name before the Gentiles and kings and the children of Israel” (Acts 9:15). Paul’s message was “Since therefore, we have now been justified by his blood, much more shall we be saved by him from the wrath of God” (Rom 5:9). What about those that haven’t ever heard the gospel? Paul writes that the “Gentiles, who do not have the law, by nature do what the law requires, they are a law to themselves, even though they do not have the law. They show that the work of the law is written on their hearts, while their conscience also bears witness, and their conflicting thoughts accuse or even excuse them on that day when, according to my gospel, God judges the secrets of men by Christ Jesus” (Rom 2:14-16), so all mankind is without excuse. It’s not our responsibility to save anyone…it is all God’s responsibility, but it is our responsibility to tell them, so it is really “their” response to “His” ability. We can thank God for that. If God has brought you to repentance and trust in Christ, then you are of Abraham’s seed. It’s not that you’re descended by birth from Abraham, Isaac, and Jacob, but God says of you, “They are my people” and we say, “The Lord is my God,” and thus, all true Israelites, who are “heirs according to promise,” both Jew and Gentile, will be saved. All of them! Right down to the very last person saved just before Jesus Christ returns. Take a look at this related article: Why Should We Pray for Israel?